Greece has "serious indications" that a fire that killed at least 83 people near Athens earlier this week was started deliberately, Citizen Protection Minister Nikos Toskas says. 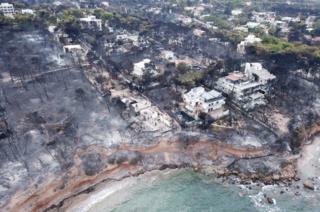 The blaze broke out on Monday and hit coastal villages popular with tourists. Some 60 people are still being treated in hospital, 11 in intensive care. Dozens more are missing. Opposition politician Maria Spyraki accused the government of an "abject failure" to protect lives and property. Ms Spyraki, spokeswoman for the conservative New Democracy, said the government ought to have warned residents via the media, deployed more firefighters, and evacuated people from Mati immediately. The coastal area east of Athens was known to be high-risk, the Greek daily Kathimerini reports. Rescue workers searching a cliffside in the seaside town of Mati found more human remains on Thursday. More than 500 homes were destroyed, and some have not yet been examined. Identifying the victims is proving difficult as the bodies are so badly burnt. Many were caught close to the cliff as the flames spread rapidly, whipped up by winds as high as 120km/h (75mph). Some survivors were saved by the sea, but dozens of victims were unable to reach the water. 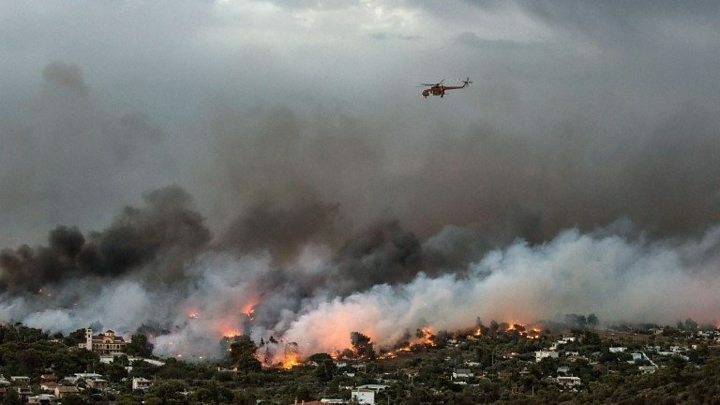 Mr Toskas also said that another fire that broke out near Athens a few hours earlier - but did not cause casualties - had been started intentionally. He added that "climate conditions" in the areas affected by fire were "extreme due to climate change". Earlier, Greek Defence Minister Panos Kammenos told the BBC that illegal construction had contributed to the disaster. He said building by residents between wooded areas was a "crime" that had resulted in blocked escape routes. 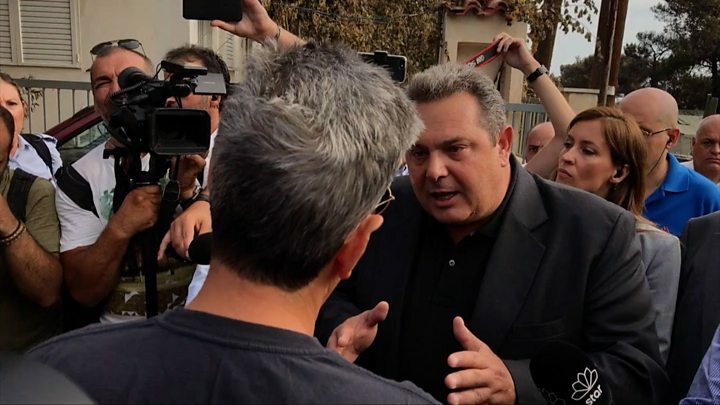 Mr Kammenos was confronted by angry locals as he visited areas devastated by fires east of Athens this week. Arriving in Mati, where many people died, the minister was surrounded by residents who accused him of abandoning them. But Mr Kammenos argued that the actions of some residents had closed the roads to the beach. "This is a crime from the past," he said. "This coast of Athens, all these properties, the majority are without a licence, and they have occupied the coast without rules." Among those still missing are twin nine-year-old girls Vassiliki and Sofia Philippopoulou, who were with their grandparents near Mati at the time of the fire.